Second Harvest Asia (2HA) Chair Charles McJilton visited three disaster-hit areas in Central Philippines from Nov. 13 to 18. After the trip, 2HA and our local organization Food Bank Philippines decided to focus our relief efforts on the area in the northern part of IloIlo by partnering up with the University of Philippines Visayas. We would like to extend our sincere gratitude to all the individuals and organizations that offered support in forms of cash donations and supply donations. Red Cross Taiwan/Taichung Food Bank quickly shipped more than three tons of rice and aid goods to our partner in the area we work in Northern IloIlo. Here is the report about the trip and 2HA’s plan for our relief operation. 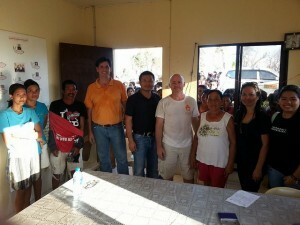 2HA’s Charles McJilton and board member Bruce Hall in Northern IloIlo. You can view more photos here. alongside the road in and in the fields as some have started to burn fallen branches. However, wake of destruction is still very visible in every place I visited. We will send relief goods that will address immediate needs. These goods will be distributed through a local relief agency I have met or All Hands, an agency we worked with in Tohoku. If you want to send something in our container, it needs to be at our warehouse by the “2hj cutoff” so we can prepare it for loading.